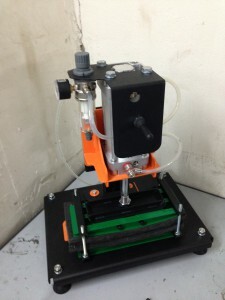 Device PRESS is a pneumatic system crimping blades of hockey sticks. One of the most important tasks during the repair, is a dense packing of material in the repair area. High pressure allows to increase the adhesion, to reduce material consumption, save the properties of the blade, to reduce the weight of the repair. The device consists of a pneumatic unit control node, adjusting the compression force of the matrix blade for hockey sticks.